If you are interested in putting together a bundle of any or all of the items we have below, please Click Here for our special rates and more! Over 90 Minutes of Basketball Instruction • All Access to College Practice • Covering Advanced Tactics of Teaching and Developing the Pressure Pack Line Defense • Covering Topics such as: Conversion Defense, Defeating Various Screens including Ball Screens, and Defending Common Offensive Movements • And much, much more! For Order Form, Click Here. Over 90 Minutes of Basketball Instruction • All Access to College Practice • The Jim Boone Winning Philosophy • Building Blocks of the Pack Line Defense • Team and Individual Developmental Drills • Daily Maintenance • All in HD Quality! For Order Form, Click Here. 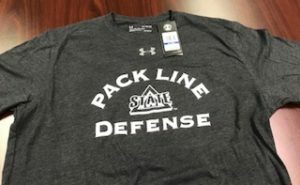 For a Short Review on the Pressure Pack Line Defense DVD, Click Here. Coach Boone provides you with drills to maximize ball pressure, while sealing gaps against ball penetration into the paint area. Boone also gives examples of his “jump up, jump back” and “leverage seeking” close out drills which are highly effective for training the proper rotations of the defense. His 4-on-4 transition drill helps to guard against mismatches and improves on-floor player communication. To purchase, click here. Army Drill Video from Building Blocks, click here. Coach Boone’s Motion Offense Video has sold nearly 10,000 copies across the United States and around the world, as it was among the first teaching videos on the market to incorporate actual game footage to aid in the description and teaching of the Jim Boone Motion Offense. With over 80 minutes of video instruction including on court drills, game footage, and black board X & O diagramming with Coach Boone, this video is still one the best teaching tools available and is a must for all coaches. To Purchase, click here. Introduction to Jim Boone’s Motion Offense DVD, click here. A detailed inside description of the Jim Boone’s Motion Offense containing over 125 pages and 91 diagrams. The book gives an insightful look into teaching and coaching motion offense by breaking the offense down into three categories: Control, Structure, and Development. One of the many fears that coaches have in implementing motion offense is their ability to control the action of their players. Coach Boone goes into great detail regarding how his program accomplishes this through shot selection, defining roles, and the teaching of offensive discipline as opposed to set plays or continuity offenses. Coach outlines the importance of teaching players how to play and their ability to make plays, along with the various cuts and screens that are employed in the Delta State Motion Offensive attack. Coach Boone goes into the teaching points utilized by his staff in teaching each screen and cut, illustrates a number of teaching aids, and finally addresses the principles of play that are taught in the Jim Boone Motion Offense. The reader is then taken through each of the various alignments that are utilized to position your players in areas where they can best use their strengths. Lastly, Coach Boone provides the reader with just how the Delta State staff goes about implementing and developing the offense. It is here that Coach outlines a number of the drills he has used for over 20 years as a successful collegiate coach. The book also includes sample practice plans from which to view how the staff has incorporated their teaching of motion offense into an individual practice, a list of offensive goals, important statistics that indicate the offense’s success, and Coaches own “Trouble Shooting” chart to address problem areas and how to fix them. Jim Boone’s Motion Offense Book is a great teaching aid for any coach, and can be used alone or to compliment the material covered in Jim Boone’s Motion Offense video. Currently, The Motion Offense Book is out of print, please check back at a later time for a re-printing, for comments, etc, click here.